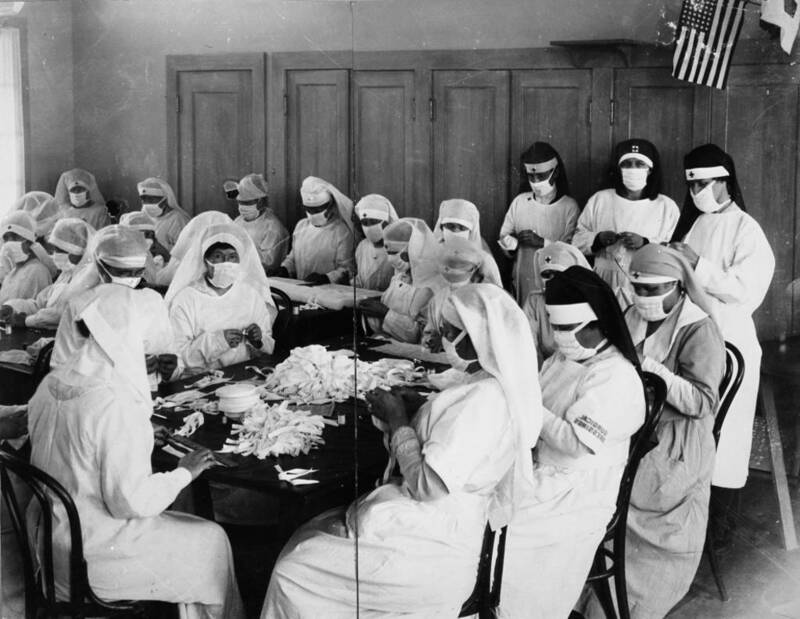 This photograph shows female American Red Cross (ARC) volunteers making surgical dressings for victims of the the influenza pandemic of 1917-1918, which affected as many as 500 million people worldwide. The ARC provided a vehicle for the eager American public to give aid and humanitarian assistance during this crisis. By 1919, the American Red Cross had thirty-three million people on its member rolls. Rogers, Edward A. "Doc," “American Red Cross volunteers of 1917-1918 preparing surgical dressings,” Digital Public Library of America, https://dp.la/item/99245ff725ef7cd4613141131c09be2b. Courtesy of Oakland Public Library, Oakland History Room and Maps Division via California Digital Library.